A booklet of the memorial service for Agnes Logan Braganza. Pamphlet for the memorial service of Chung-Wu Chang. 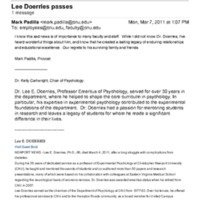 4.11 In Memoriam Dr. Albert E. Millar, Jr.
Dr. Lee Doerries, Professor Emeritus of Psychology, died on March 4, 2011. Obituary included. 4.11 A Celebration of Life: Thomas Edward Weiss, Jr. Announcement of memorial service for Dr. Savitzky. 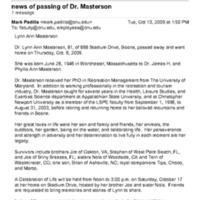 E-mail announcing the death of Dr. Lynn Ann Masterson, a retired CNU faculty member. An email announcing the death of Vice Provost Dr. Tracey Schwarze.